You exit the exam room following the doctor as they hand your medical chart over to their optician. With prescription printed in hand, the doctor closes with “I’ll be seeing you next year”. But is this the end of your exam? Think again. While many online and commercial retailers will have you believing that with your prescription, from there it is a one-size-fit all model, that is absolutely wrong. While the doctor’s ocular health evaluation is irrefutably essential, clear and comfortable vision is executed in a proper eye glass fitting by a licensed optician. 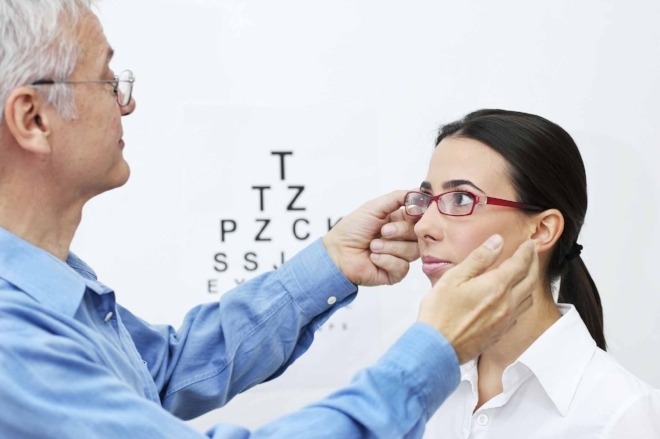 Opticians are formally trained technicians in the field of optometry. Based upon your individual prescription, they provide eye glass frames, lenses, and contact lenses following a medical fitting with your optometrist. Opticians obtain their license through rigorous course of study consisting of optics and design to perfect fittings for vision enhancement. Here at Good Eye Optometry, we pride ourselves on providing exceptional comprehensive eye care, including the careful fitting process taken with each exam. We exclusively hire experienced opticians who are formally trained and licensed. Our opticians not only consult on frame, and lens selection for individual needs, but will also perform professional adjustments upon receiving the finished glasses to complete a fitting. You would never leave your tailor without trying on your custom made suit, why would you ever walk out without trying on your custom fit glasses? What happens when you don’t get “fit” properly? The most common fit issues can actually cause physical pain. When glasses are too tight, they pinch the sides of our face and not only leave imprints, but over time, cause headaches. On the other hand, if glasses are too loose, they can continue to slide down your nose and create the annoyance of continually having to physically hold them in place. Being loose also increases the risk of dropping your glasses and breaking them entirely, rendering them useless. Lastly, what is most commonly over looked, is when lenses are improperly fit, they can actually distort your vision. At every fitting, our opticians take the time to take accurate measurements for lens placement to avoid visual distortion. A common phenomenon caused by inaccurate measurements is called induced prism. This phenomenon is when your glasses shift images to another portion of the lens causing you to continually have to compensate by looking in different locations of the lenses for clear vision, or even causing headaches, dizziness, and sensations of floating or swimming. If the lenses sit too close, or too far from your eyes, this can change the power of the lenses themselves. Even with an accurate prescription, you may feel as though your glasses are “too strong”, or “too weak”, because you have effectively produced a different powered lens. Here at Good Eye Optometry, equal considerations for style, comfort, and vision are taken with each individual fitting. Our opticians are here to provide professional and honest care. Because of this, we don’t always stick to the conventional “style guide”. We see you as an individual, not just a face shape on a chart. Does this thing look familiar? Many online retailers have produced the perception of being able to effectively fit yourself in glasses without ever being seen in person. Wrong. Apart from the risks of a poor fit as previously mentioned, it also produces a misconception that there are only certain frames which will flatter your face. While they often employ the ever popular “find the perfect pair of glasses for your face shape” chart, at Good Eye Optometry, we see that you are so much more than a figure on a chart. Our opticians will always recommend frames which will flatter your face best. But there are no limits in styles here because our opticians are knowledgeable in incorporating elements of the all different shapes and designs to still meet your personal style. You are unique; we want to ensure that your glasses are a reflection of this. If you are looking for a new pair of glasses, or if you own a pair of glasses you’d like to have professionally adjusted, we are excited to be here for you at Good Eye Optometry to meet all your vision needs. Chronic Dry Eye: There IS a solution!